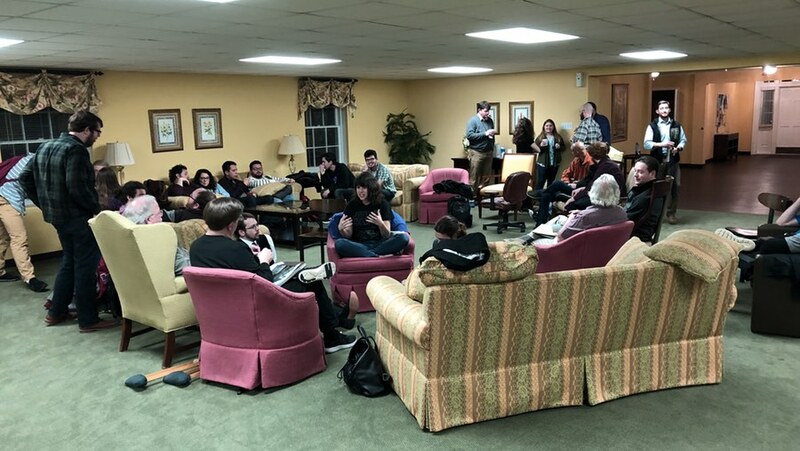 A refreshing break from the thinking Christian's too-frequent loneliness, at an evening conversation at Defend 2018, New Orleans. The speakers’ talks weren’t the real highlight of the week. It was the conversations instead. Every time I ask that question, every hand goes up. Just about the only exceptions are students and faculty members at colleges and seminaries. Thinking Christians feel lonely. There’s a sense that it’s weird for believers to care about matters of the mind. It’s not that God expects every Christian to be intellectual. We all have different gifts, as we’re taught in 1 Corinthians 12 and elsewhere, and with differing gifts come differing motivations. The Church would be quite a strange place if everyone in it were expected to have the same interests — and chances are, a church filled with thinkers would be sadly short on doers. But as Professor J.P. Moreland explains in his book Love Your God with All Your Mind: The Role of Reason in the Life of the Soul , this comes at a real cost. For centuries the Christian faith was viewed as a source of real knowledge. Christians founded all the first universities, both in Europe and in America. Christians founded all the natural sciences, and continued to lead in science long after it was underway. Similar stories could be told in music, literature and other arts. But sometime around the middle of the 19th century, we began an intellectual retreat. It only took a few decades before we’d lost so much ground, Christianity was (falsely) thought to be opposed to reason and science. Retorts like that are no help when people aren’t sure they believe the Bible in the first place. That’s the tragic outcome of the loneliness of the thinking Christian. The other sad part of it is how needless it is. Christians make it through college, after all. Not everyone, of course — but enough that it shouldn’t be hard to find many of them displaying some intellectual vigor in local churches. Christianity still has plenty to be vigorous about. And Christianity still has plenty to be vigorous about. Rumors of its being “anti-science” are simply false. Real historians of science all know that; it’s only dabblers who think there was ever any real conflict there. And there’s a bounty of scholarship these days in favor of Christian belief. As Dr. Gary Habermas told us at last week’s conference, there once was a time when almost no scholar believed the New Testament accounts contained actual history. Historians today, however, are almost unanimous in agreeing on some of the most crucial parts of the message. And that’s just a sampling of Christianity’s growing intellectual strength. It was a rare privilege to be involved in conversations like I had last week. It’s not for everyone, I know. But I pray the day will soon come when it’s no longer hard to find. Growing up in various evangelical/pentecostal churches, higher education wasn’t much valued in some places, except for bible college… assuming they were theologically aligned of course. I’ve often heard about Paul considering all his advantages as waste, the inference being if he thought his education was waste then why waste time getting an education. Of course that isn’t what that passage is about, but then the Bible degree was needed in ministry. I think some pastors just like to feel like the smartest one in the room. And if anyone gets a little big in their britches he’ll toss around words like apologetics, eschatology and hermeneutics, and throw in some greek and hebrew for added effect to keep them in line. Unfortunately with secular universities getting more hostile to Christianity it sort of reinforced that attitude and I’ve still recently encountered it though thankfully far less of it. Doesn’t sound like any evangelicals I ever met. Most of the ones I know don’t even know Bible colleges exist. Anti intellectualism is thought of as being an enemy of faith. Also it helped pastors continue being lazy. Intellectualism is actually normal thinking. Unfortunately, it is portrayed as the preserve of the elite. So let’s couch our intellectual arguments in everyday language, faith, and actions. We have to love our God with all our heart, mind, and strength. Churches that encourage discussion of theology are few and far-between. However living in the large Southern California urban area, I have been able to find a number of groups that offer good discussions of Christianity, religion and philosophy. Some I’ve found by word of mouth, and some via the Meetup website. You can learn a lot, especially if you can handle challenges to your theology. I have read both the article and the responses very thoroughly. I would like to be candid and offer some help of reality, especially to the brethren who are Western-minded. My fraternity is both Western and African, and theologically formally Western schooled of British and American flavors. The reality is that Christianity was born into the African (so-called Middle Eastern) culture, but popularized, conceptualized (epistemologized), and disseminated by Western culture. What happened then? Paul said something very important for our eye-opener, those of us who are sincerely searching to encounter the Creator for true personal relation and peace in eternity, I Co1:22 that ‘the Jews (African-minded) ask for “Sign”, and Greek (Western-minded) seek after “Wisdom”. This reality, which is even true today has a very dire consequence for our Theology and Christianity at large. Why?, for the reality is that the culture (African) in which God choose to reveal Himself ( because it is primitive and thus stay true to the Supernatural and Natural Reality) is different from that which is packaging and broadcasting it, the Western Culture which has been highly Proggressive, based on Greek Philosophy and associated Sciences. The unfortunate result has been that the true nature of encountering God and transformation thereof, both in being (substance) and living (theologizing) is lost through the Western transition. And so theology and doctrine has rather become a mind business (Wisdom – philosophy) which is stuck with the mind, and for that business (our reflection and theology) are not true icons of the Reality. Our reflection and theology has become a fantastic story of a cinema hall, and when you step outside it is a different world. Who cares about that that can hardly translate unto everyday reality? Unless our theologizing and its substance is able to transform us into that Image of God, which the Messiah exemplified, not just even in character, but also in substance, combining flesh and spirit to supernaturally subdue the cosmos, we are not there yet, for we are not like the Messiah, Yahowah. For He really mean to give birth to children who are exactly like Himself, though smaller that they may be, like ourselves and children. Greetings, Ebenezer, and thank you for your thoughts here. I am very sure we Westerners have much to learn from other cultures, including yours. I understand your background includes Western schooling, so you are in a better position than I am to see the two sides in comparison and contrast. Having said that, I must express some cautions. First, I’m not sure what you mean by saying we are to be like the Messiah in substance. One be ry natural way of reading that, based on a standard definition of “substance,” would be to say that we, too, should become deity as He is. I hope that is not what you meant. Second, even as you raise cautions about an overly heady form of religion, you speak it in a way that only truly thinking (and rather heady) Christians would even be able to read. You use technical philosophical terms, and you propose some rather complex distinctions of your own. My article here is in support of the kind of thinking Christians that your comment presupposes as readers. So I can only assume that you don’t disagree with that sort of mental exercise among Christians! It’s not really clear to me, then, what you are saying is wrong with the Western approach here. My best guess is that you’re raising a caution against merely intellectual faith, while yet assuming that readers will develop enough intellectual skill to be able to think clearly about these things. If my formulation of it is correct, then we do not disagree on these things, depending of course also on what you meant about becoming the same in substance as Christ. You read me perfect, Tom. We agree that there are few who dare to think, and that is a charge against the whole world, but not just Christians ( for if the world did, they all would be Children of the Most High). So then, we disagree that thinking if not for all, for a being in the Image of God must be thinking all time, and not operate by templates. For it is only by constant thinking that the Darkness (Satan and his lies) may be stopped from clouding the Light for us. Now the Western environment and culture is not able to ‘wholly’ understand some very important realities (please I speak with humility, bear with me) of Scriptures, as sincere and diligent a thinker or worse a scholar may try. Something which is not whole is defective in its operation, and simple things become hidden in the complexity of knowledge and at the hands of sophisticated research devices. Now the thinking then become harder and harder and unattractive. But if we understood some realities, the thinking would be easy and palatable. Myself, I am bedeviled, just that I have come to the realization, and started working. Now the “substance”. Yes, I mean your understanding, but in all things Divine, there is always the Head. Therefore us becoming little Gods will not change a degrade Yahowah in any way. In fact, God’s Kingdom would become stronger over Satan’s. And that is the Ultimate Aim of God, to bear Children exactly like Himself, even as a crab does not give birth to another, say bird, but a crab. For the fact that Satan’s Children are more like him in ‘substance’, the rule over us today, as we are hardly moved in maturity to the Image of our Holy Father. And this is what Genesis to Revelation is saying, “God giving birth to children of His Kind”, but for now we hardly pass as God toddlers. Please don’t cut me off if I sound strange and heretic. Keep the conversation. We are thinking and you crave company, even as I do. I cannot edit, I my rush home. Stay blessed and thinking. One of my favorite books was FIERCE CONVERSATIONS by business consultant Susan Scott. She recounts examples of businesses that went under because they failed to encourage and allow the kinds of honest conversations necessary to improve and then save businesses. I see the same need in Churches and Christian circles where honest discussions of important issues are shunned. One example: Why do Christians support antichrist, violent Zionist Israel? Bring that one up and you will find yourself shunned, yet it will probably spell the end of churches and ministries unless they correct it. Younger Christians are catching on to the duplicity and hypocrisy of such, and to support today’s Zionist so called Israel is to violate all kinds of Old and New Testament scriptures, and the teachings of Jesus. Praise God, Yahowah for thy eye is whole. But how many of our brethren can see, for they behold with deceased eyes and ears of fattened heart. My experience is that free thinkers are viewed as dangerous. A pastor can’t have a free thinker asking difficult questions that challenge established church doctrines as that will cause doubts to develop in the assembly. Doubt is viewed as the enemy of faith. What if an in depth conversation about Trinitarianism v. Arianism leads to the group rejecting Trinitarianism? A Pastor can’t have that happen so he discourages such conversations from taking place. Thinking takes effort. Many Christians are satisfied believing what they believe is true and are not interested in making the effort of entertaining the possibility they might be wrong. They’re not interested in the conversation. They already have the answer. Trilemma: “Freethinker” is a synonym for atheist; more generally, “one who forms opinions on the basis of reason independently of authority; especially one who doubts or denies religious dogma.” That broader definition carries baggage, however, as it does not distinguish good and trustworthy authority from bad or unreliable authority (and seems to forget that ultimately everyone appeals to an authority in his or her thought), elides over the misapplication of reason and neglects to consider the limitations on human reason; and pejoratively refers to “religious dogma,” which is often a stand-in for unreasonable authority. It might help if you would confirm this is the sense in which you meant to use “free thinkers” or whether you are talking about independent thinkers. I hope you don’t mean to stereotype Christians as not being able to think for themselves. And while doubt might be viewed as an enemy of faith, I maintain that honest doubt can be an ally of faith, provided that doubt is a spur to more study and searching. Any “in-depth conversation about Trinitarianism v. Arianism” that leads a discussion group to reject the biblical doctrine of the Trinity is a poorly-instructed and poorly-conducted conversation. We (the church) have already had that discussion and Athanasius won by a landslide. The case is settled. That some people refuse to listen (e.g. Jehovah’s so-called Witnesses) does not call that back into question. The final quote is fatuous nonsense spewed by the unbelieving writers of a fictitious television show character. “House” was never adequately challenged in his cynical atheism because the writers could not afford to–or were not prepared to–meet the challenge. If we’re going to have a pitched battle of fictional wits, I’d like to see Gregory House take on Father Brown or Professor Digory Kirke. “Freethinker” is not a synonym for atheist but it is for independent thinker. The definition of freethinker, “one who forms opinions on the basis of reason independently of authority; especially one who doubts or denies religious dogma,” is what I mean by freethinker. Freethinkers question authority to determine if it is good and trustworthy. Christians generally accept the Bible and what their pastors say as good and trustworthy authority without question. Freethinkers are well aware of the limitations of human reason and knowledge. I believe everyone is capable of thinking for themselves. I wish more would. The fact that there have always been Christians who don’t believe God is triune shows that the matter is not settled. Emperor Theodosius, who was about as much a Christian as Donald Trump, tried to settle the matter when he issued an edict that read: “We now order that all churches are to be handed over to the bishops who profess Father, Son and Holy Spirit of a single majesty, of the same glory, of one splendor, who establish no difference by sacrilegious separation, but (who affirm) the order of the Trinity by recognizing the Persons and uniting the Godhead” He also issued an edict to punish those who didn’t go along. Why would the church go along with the government trying to dictate church doctrine? The House quote is hyperbole but has a valid point. Many Christians have become atheists or deists as a result of applying reason to their beliefs. The debate you suggest of House vs. Brown or Kirke does sound interesting. Because the Pastor himself is not an ‘original thinker’ (don’t want to cause any legal issues with ‘free thinker’), he doesn’t own that which he is teaching by having to go through the actual mining of the ‘truth’ that he suppose he is teaching, therefore he cannot answer to hard probing questions. The result is that even if what he says is true is true, the power and drive of the said truth is lost, and as he only goes about quoting NASA, Washington Post, and some dogmatic christian journals for support and effect, but get the people bored any way. In the end they are not lead on the journey of discovery; and if the said truth is a lie, it gets stuck with us forever because people are not thinking; and the lie is fruitless among the Truth community. Your message comes at a good time. I’m so disappointed at the lack of interest among my fellow Christians I sometimes feel like abandoning the church and going back to my secular roots… (which I can’t and won’t do, of course.) I sometimes feel locked into a box full of Grape Nuts Flakes. Thank you Tom for shouting out that the emperor has no clothes. The church needs to become better that having thoughtful discourse both on the foundations of our faith as well as responding to the vast array of cultural issues. If believers do not learn how to engage these issues within the church, how will they be able to engage meaningfully with their neighbors and co-workers? Greg Koukl, speaking on healthy in-church debate, put it well in his book Tactics when he said “when arguments are few, error abounds”.